The independent transport videos cameras have returned to Yorkshire to bring you this update of what has been happening with the bus world in the county since the last visit we made in 2015. This time the programme is entitled ‘West & East Yorkshire’ as we cover part of the area that was operated by the erstwhile West Yorkshire Road Car Company, as well as straying into North Yorkshire and completing our tour in East Yorkshire. Beginning in Castleford and finishing in Hull we visit Leeds, Harrogate, Ripon, Ilkley, Otley, York, to name but a few on our way. There is plenty of variety for you to see, as there are in excess of fifteen operators seen on this programme! Filming took place during the summer of 2017 and began in the small town of Castleford where we see brand new ADL Enviro400 MMC double-deckers belonging to Arriva Yorkshire wearing both the new standard livery and the new Sapphire scheme. Independent fleets of Ross Travel, Stringers and CT Plus are also captured by the camera. After a brief stop in Garforth, our next location is Leeds. First West Yorkshire, Arriva Yorkshire and Yorkshire Tiger are the main operators here. We also see the Transdev Blazefield operations of Yorkshire Coastliner, Harrogate & District and their CITYZAP express service that runs to York. Harrogate & District’s new high profile Volvo B5TL Wrightbus Gemini 3 double-deckers are also seen in their smart red and black livery for the 36 service that runs between Leeds and Ripon via Harrogate. Filming takes place at a number of locations around the city including the new Temple Green Park & Ride site, York Street, Bus Station, New Market Street and The Headrow. We then move to Harrogate, but on the way see some of the smart Volvos on the 36 service passing through Harewood. Harrogate is a lovely spa town, also with a good selection of buses! Transdev Blazefield’s Harrogate & District is the main operator with Harrogate Coach Travel – branded as Connexions, also present in a green and white livery. The latter has two vehicles painted in heritage liveries, one in their early Challenger scheme, and the other in National Bus Company - West Yorkshire, poppy red with a white band. Locations include Station Parade, Station Avenue and the Bus Station. We now take a look at some archive video filmed in the Bus Station in the late 1980s and early ‘90s by local bus photographer, Malcolm King. 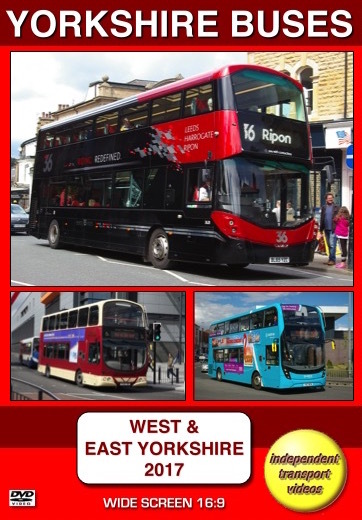 From here we move onto Ripley, Ripon and Ilkley where at the latter we see Transdev Blazefield’s Keighley & District smart green and blue buses in service alongside new First West Yorkshire ADL Enviro400 MMC double-deckers branded for the X84 service to Leeds. After a brief stop to see the bus action at Leeds Bradford Airport we descend on York. Plenty of action to see here as our cameras film on Station Road, Bridge Street, Piccadilly and Coppergate. First York and Transdev Blazefield are seen in abundance here. Look out for First York’s 35100 (SK17 HHD), a Wrightbus Streetdeck Mk 3 with ‘Micro Hybrid’ technology and a ‘Euro 6’ engine. We also see CITYZAP buses at the other end of their route. Our final destination on this programme is Hull. Home to East Yorkshire Motor Services, we see plenty of action as their vehicles run alongside Stagecoach in this busy city. Both companies have immaculately turned out vehicles and we see them operating in and out of the Paragon Interchange on Margaret Moxon Way. Other locations include Prospect Street, Bond Street, Queens Dock Avenue and Carr Lane to mention but a few. We are sure you will enjoy this packed programme of Yorkshire buses going about their business, as they know best!